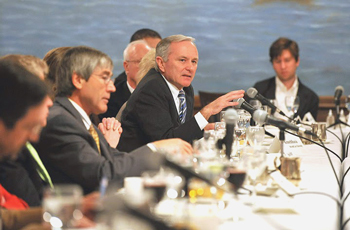 Washington and Lee President Ken Ruscio joined the presidents of Arizona State University, the University of Pennsylvania and Rensselaer Polytechnic Institute, plus several internationally renowned scientists, including physicist Freeman Dyson, for a wide-ranging discussion of current scientific issues with members of the national media this week. 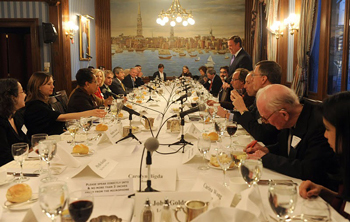 Hosted by Arizona State President Michael Crow at the Penn Club in New York, the session was an on-the-record event that drew representatives from the New York Times, NBC, Newsweek, Nature and Scientific American, among others. The Japanese nuclear crisis was a primary topic. One of the journalists present, Robert Bazell, from NBC, had just returned from two weeks in Japan, allowing him to offer first-person insights. Among other topics was governmental support for scientific research and the need to improve science instruction in K-12 education. On that topic, President Ruscio referred to the Howard Hughes Medical Institute grant that supports W&L’s efforts to provide training for teachers in Rockbridge County.